*Place aluminum foil on broiler and coat with a thin film of olive oil and place flounder fillets on oiled foil. *In a blender or food processor, chop tomato, celery, onion and basil with lemon juice and spread over the flounder. *Add S&P to taste or diet. *Sprinkle a little Parmesan cheese on the top and bake at 375 degrees until flounder is flaky and still moist. _ Place flounder fillets on oiled foiled broiler pan. _ Cover each fillet from head to toe with butterflied shrimp. _ In a skillet, heat olive oil and butter and lightly brown garlic. _ Add wine, juice of the lemon, thyme, S&P heat to boiling, and stir in mustard. _ Reduce liquid to about one half until thickened. _ Pour over fish fillets and shrimp. _ Sprinkle Parmesan cheese and bake at 375 degrees until flounder is flaky but not dry. With a fork, blend together the feta, garlic, dried tomatoes, S&P and enough olive oil to make a smooth paste (this is an excellent hors d’oeuvres with crackers or thin crispy bread slices). Sauté spinach in butter briefly to just wilting. Add feta cheese mixture to the spinach in the sauté pan, and loosely mix. Place the trout on a lightly oiled sheet of aluminum foil. Spread the spinach/feta mixture evenly over the filets salt and pepper to taste. Bake in a hot oven (375°-400°) for no more than 10 to 15-minutes, until the trout just starts to flake. If you don’t want to use the one with spinach here is another p/c one. Drizzle 1 tablespoon of olive oil over each fillet. Crumple equal amounts of cheese over each fillet, scatter olives and a small amount of lemon or lime juice. Season with salt and pepper, thyme and some fresh parsley. ¨Fold the foil over the fish and crimp edges to tightly seal. Place on a baking sheet and bake for 10-15 min, until fish is opaque throughout. Don’t overcook. Posted by Doc & filed under Fishing, Recipes category. *Place flounder fillets on oiled foiled broiler pan. *Cover each fillet from head to toe with butterflied shrimp. *In a skillet, heat olive oil and butter and lightly brown garlic. *Add wine, juice of the lemon, thyme, S&P heat to boiling, and stir in mustard. Reduce liquid to about 1/2 until thickened. *Pour over fish fillets and shrimp. *Sprinkle Parmesan cheese and bake at 375° degrees until flounder is flaky but moist and cheese is lightly browned. *Chop the almonds finely with a knife on a cutting board. Add almonds to Panko (Japanese bread crumbs) and spices. Posted August 3, 2017 by Doc & filed under Articles, Fishing. Surf at Bogue Pier ranged from Low of 77° to a high of 81° with an average of 79.0° (blue diamonds). Bogue Sound had a low of 76° a high of 85° with an average of 82.3° (red squares). 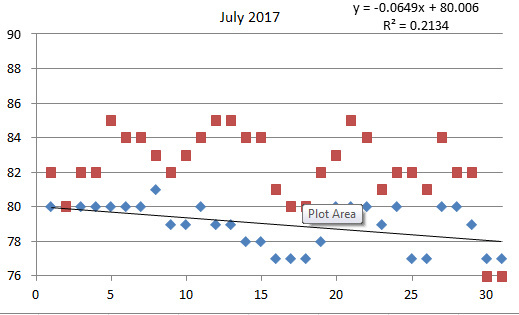 July temperatures were nearly flat with a slight downward trend, unusual for July with most of the month running below normal after such a warm winter and spring. Average surf for month of July is around 81°. Recent headlines from Marine Fisheries: “NC Recreational Salt Water Landings Down”. NCDMF has reported that although the fishing effort is up, that is there were 16% more fishing trips in 2016 compared to 2015, anglers caught 18% fewer fish. But as always the devil is in the details! One bright spot is last year’s great statistics for speckled trout which were nearly five fold above 2015 levels, but provided some of the best trout catches in recent years. We can even see the spillover into this spring and summer, where catches of big trout is notably better than we normally experience this time of year. And this is in the face of frequent winter trout kills in the last few years. I’m sure bag and size limits have helped rebuild these stocks along with season closures. So in 2016 if you didn’t routinely get your limit of trout, you just weren’t trying. What are other notable pluses and minuses that contributed to this report? Offshore pelagics, one of the most targeted species, the dolphin (mahi-mahi) dropped nearly 40 percent but yellowfin tuna catches tripled and was the highest in the last 5-years and wahoo catches were up modestly. Wahoo catches have actually been very strong for the last year or so. Yellowfin catch has been low here along the crystal Coast, but numbers must reflect much better catch numbers farther north in the state. Inshore and nearshore catches had a mix of good and bad news. Red drum and southern flounder had modest increases as had bluefish but the bottom panfish catches were considerably lower and that includes spots, croaker and sea mullet (a.k.a. kingfish). By just checking the local fishing piers and you could have predicted that. The mackerels are still going strong both from the surf, piers and boats trolling along the beaches although the Spanish catches were down from 2012 and 2013 numbers. On the other hand, and I can attest to this, summer flounder catches continue to drop dramatically with more and more of the catch coming from nearshore reefs wrecks and ledges and fewer from the beach, piers and inlets. In 2016, the summer flounder catch is less than 30 percent compared to 2012. The last few years I can only find short throw-backs and never come close to a bag limit of four fish. One interesting success has to do with black drum. As you remember North Carolina finally instituted size and bag limits on this species. People often were keeping juvenile spot-sized fish well before maturity. The year that a 10-inch minimum length and a 10-fish bag limit was instituted, the catches of the black drum plummeted. Since then, the numbers have steadily increased and the average size of the fish has also increased each year from under two-pounds prior to the new limits to well over three-pounds per fish since the new limits were instituted. Exactly what one would hope, let the babies live and get bigger and reproduce and you get more fish and bigger fish. Seems like some other species might benefit from similar regulations. So how did you do in 2016? So far in 2017? For details on the commercial and recreational catch data check out: http://portal.ncdenr.org/web/mf/marine-fisheries-catch-statistics. Surf at Bogue Pier ranged from Low of 72-degrees to a high of 80-degrees with an average of 77.1-degrees (blue diamonds). Bogue Sound had a low of 68-degrees a high of 85-degrees with an average of 79.4-degrees (red squares). 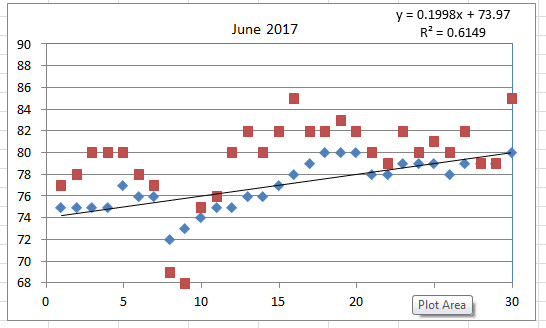 May temps fluctuated a bit but increased steadily increased about 0.2-degrees/day and we continue to be above normal compared with my 20+ years of data. We hit 80 degrees in the surf by the end of June. Normally we see that in early July. This year the water temps continue to be above normal. Watch out for an active hurricane season. I’m (Dr. Bogus) a scientist so I always like to look at things from the scientific viewpoint, so when I saw the article by South Carolina fishing and outdoors writer Brian Cope on noise and designing noisy baits I thought that was a really interesting article. 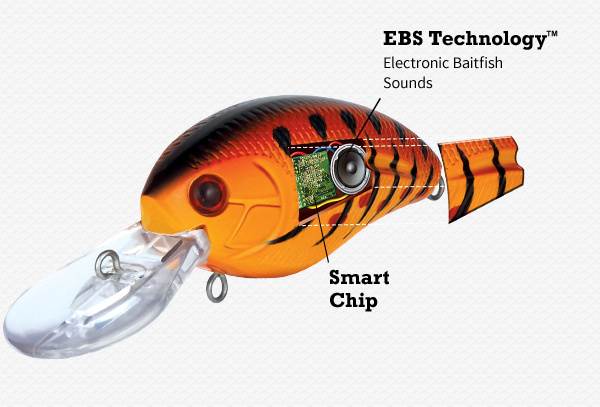 One of the things about that is we know that fish hear, how DO fish hear and how do we use that to create useful baits? According to Cope, fish can hear in two ways, first high frequency sounds through their ear stones called otoliths inside their heads and secondly they “hear” low frequency vibrations through their lateral line, which you can clearly see in most fish, it’s just a line running down the center of their body lengthwise along each of their sides. So what do they hear? There is something we need to know about sound in the air and water…the scientist in me of course. If we have a thunder storm and, we’ve had some lately, if you see a lightning strike somewhere, the thunder and other noises travel about five seconds/mile in the air. On the other hand in water, sound travels really fast, about one-second/mile. Some of the early baits, some of the early things we were trying to make noise with are corks. And also, I know when I fished as a kid, popping plugs, those were some of the first ones. Brian, where did you start trying to use baits that make noise and mimic fishy sounds? 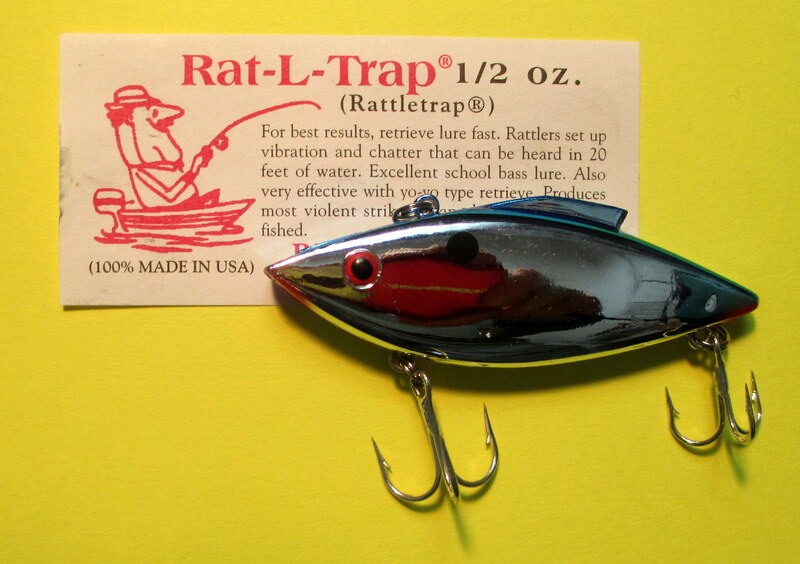 It’s interesting, you brought up the Rat-L-Traps Brian, here’s one right now (rattle sounds), and that was one of the first…Bill Lewis came up with Rat-L-Traps for freshwater bass fishing back in the 1960s. And you were absolutely right, it took people a long time to put hooks that didn’t dissolve after one use in saltwater, because they really are an excellent bait. As far as noisy baits, this was probably the first one, and is still great. So Brian, what is the difference between a noise that attracts fish and a noise that scatters them? These days there are many baits with rattle noise makers, what are some good examples Brian? For those who are not familiar, shrimp are noisy critters, snapping and popping as they move through the water feeding or escaping the jaws of a predator looking for a snack. Brian, I use a lot of top-water baits and I assume you do too, some of those baits emit different frequencies. Have you found that either the high pitch or low pitch clickers are more effective? We talked about the Rat-L-Trap which didn’t get used in saltwater until more recently, but another bait that was really popular in freshwater was the spinner baits, the bass buzz baits and we are finally getting to realize that they are effective saltwater too. They also make a lot of noise and vibrations. Like with any of the other baits there is a lot of variation, long skinny leafy blades, big round ones, they all work at a different level at the fish. Do you have any preferences Brian? Anything new and exciting out there, high tech maybe, Brian? Wow, have you used those baits and have you found them to be effective, Brian? Do you think those Livingston baits as they become more popular; the price will come down on them? Have you find a sound that works best for you or do you just try them all? Thanks Brian, hopefully we now have a better feeling on noisy baits. Good noise, bad noise, now smart chips, so let’s go catch some fish! If you like to fish, almost any bait will do, if you really want to catch fish, most people go with live bait. Here is what you need to know about catching and using the real thing for bait. But for many of us, hunting and gathering our own bait is just part of the lure, the process, yes the ritual of fishing. For the inshore and nearshore angler, the list of natural baits is seemingly endless, but the main targets include crunchy baits such as fiddler crabs, and shrimp and small finfish like finger mullet, killifish, and menhaden or pogies as they are often referred to. What do you mean, pick them up? With your hands? Now shrimp, there is nothing in the water that won’t eat shrimp. Floating them on a cork at the Cape Lookout rock jetty for specks or on a Carolina rig are the standard methods of fishing shrimp. Carolina rigs can come in several flavors, a true Carolina rig, where your egg sinker is placed on your main line, above your leader material, or a modified Carolina rig as Cronk uses, in which your egg (or slip sinker) weight is placed on your leader material between your swivel and hook. Leader material is typically 15 to 40-pound fluorocarbon and the hooks are usually gold Kahle (wide gap) hooks from No. 2 to a 3/0 in size. Now throwing a cast net is an art in itself, and is as individualized as each thrower. But that’s another article. Surf at Bogue Pier ranged from Low of 68-degrees to a high of 76-degrees with an average of 72.0-degrees (blue diamonds). Bogue Sound had a low of 64-degrees a high of 82-degrees with an average of 73.9-degrees (red squares). 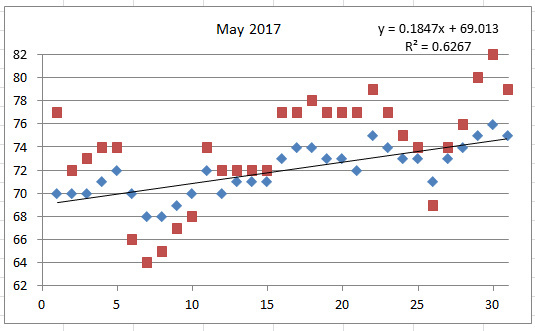 May temps fluctuated a bit but increased steadily increased about 0.18-degrees/day and we continue to be above normal compared with my 20+ years of data. We got into the mid 70s by the middle of May, more like mid-June temps. This year the water temps continue to be above normal. Watch out for an active hurricane season.